On this site you can find information on my work as a textile designer for the interior industry. In my atelier I create new printing patterns. Every series of patterns is presented on textile using all sorts of printing techniques. My specialisations are coatings, print techniques and other surface treatments. Some of the techniques I use are: coating, needle punching, relief printing/embossing, laser cutting and engraving, ultrasonic welding, pleating, transfer – and sublimation printing. Choice of fabric, pattern design and print technique form a unique combination, thus giving very specific input to industry. Clients are mostly producers and editors of interior textiles, but I also work with fashion, automotive, ceramics, plastics and paper industry. Most clients operate in the higher ends of the market. I studied Fashion design at the Willem de Kooning academy, freelanced in fashion (a.o. Marithé & François Girbaud), then for trend agencies Trend’Union and Promostyl, and VIEW magazine. 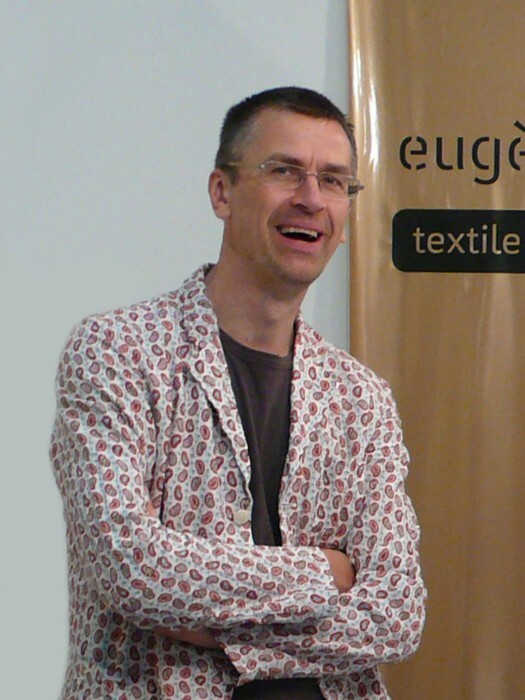 Since 1996 full-time in interior textiles, with a bit of teaching at the Royal Academy of Art in Den Haag, and writing for Dutch design magazine Items. My work is in the collections of: Gemeentemuseum Den Haag, Historisch museum Rotterdam, Stedelijk Museum Amsterdam, the Netherlands Textielmuseum and Rhode Island School of Design Museum of Arts. I show my portfolio at several fairs, and travel to clients in Europe. For North America and Japan I have an agent. For exclusivity reasons, the work shown on this site is only a very small part of my portfolio. If you want to know about the next opportunity to see all my work, you are invited to subscribe to my mailinglist by sending an email. This site was built by Nick Koning, with the kind support of Stroom Den Haag.